When starting with a new patient, it pays to have prepared carefully [Map 1], so you can begin in a positive and helpful way. At the beginning of psychotherapy, an important part is discussing the nature of psychotherapy and the parameters of treatment [Section 7]. Confidentiality is an important part of that discussion [Section 8]. Although you are working with a particular person here, much of what you say and do will have to be planned ahead of time and could apply to any patient. Still, anything suggested in the flow chart and corresponding sections of text must be adapted to the particular person you are working with, so you have a lot of latitude here to change the plan as you need, in order to be effective. 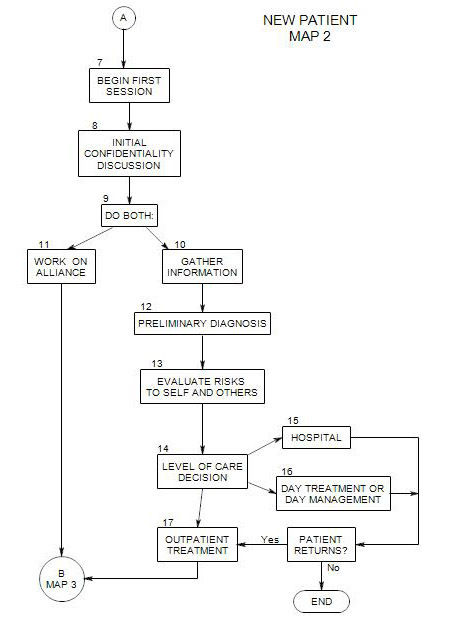 The map divides, halfway down the page, because effective therapy requires that you work on a treatment alliance with the patient and gather information at the same time [Section 9]. The information you gather at the beginning of treatment [Section 10] is necessary to come to an initial diagnosis [Section 12]. You also need to make some management choices – evaluating risks to the patient and others [Section 13] and deciding how intense and restrictive the patient’s treatment should be [Section 14]. If outpatient treatment [Section 17] is appropriate, continue with the material of Map 3. If more intense treatment is called for, consider sending the person to a hospital [Section 15] or a day treatment facility [Section 16].